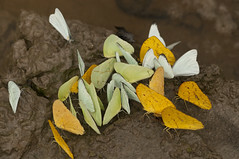 The Pieridae are members of the Superfamily Papilionoidea, the true butterflies. Worldwide in distribution, most species are found in the tropics. Adults have medium to small wings that are white, yellow, or orange, with some black or red, and many have hidden ultraviolet patterns that are used in courtship.